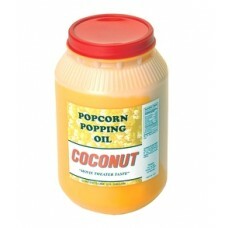 Paragon Coconut Popcorn Popping Oil (1-Gallon Jug) - Paragon's clean cooking coconut Oil. Makes golden popcorn. Better tasting in flavor and aroma. Does not require refrigeration. This non-hydrogenated coconut oil is refined, bleached, and deordorized (RBD) and possesses properties that make it unique among edible oils. It has a high concentration of medium chain triglycerides consisting mostly of short chain fatty acids and is solid below and liquid above room temperature (melt point range 75-81 degrees Fahrenheit). 76 degrees Fahrenheit coconut oil is highly stable against oxidation adn is fequently used in applications where long shelf life is desired. Its low viscosity imparts less greasy mouth feel when compared to other edible oils. This oil is non-GMO, trans fat free and considered non-allergenic.